Ruby Clyde Henderson doesn't really want to spend her birthday traveling by car to an unknown destination with her mom, Babe, and Babe's obnoxious boyfriend, Carl, known as the Catfish. But what the Catfish says goes, so Ruby Clyde is along for the ride, like it or not. Unfortunately, when they are stopped at a gas station, the Catfish commits armed robbery and both he and Babe are taken into custody. 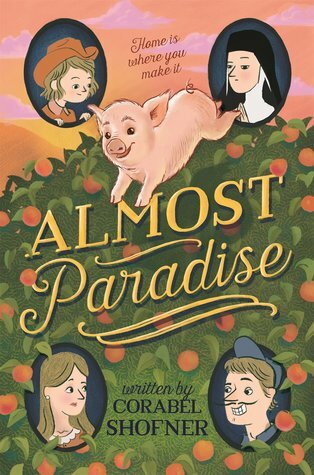 The only relative who can possibly take in Ruby Clyde (and her newly acquired pig, Bunny, who was also stolen by Carl) is her mother's twin sister, Eleanor, about whose existence Ruby has just learned for the first time. Eleanor is an Episcopalian nun who lives on a ranch called Paradise and is facing a potentially deadly cancer diagnosis, but despite living as a solitary and having her own problems, she agrees to help Ruby Clyde, and over time, the two grow close enough to begin healing the rifts in their family. I included this title on my list of most anticipated 2017 books, and the author was kind enough to supply me with a digital ARC from NetGalley. My primary interest in the story was the fact that it involves religion, since I am always curious to see how middle grade novels handle issues of faith. Since I am Catholic, not Episcopalian, I can't say much about how accurately or inaccurately the story treats this particular denomination (which it describes as a "pretty loosey-goosey, do-whatever-you-want kind of church"), but I still feel qualified to comment on how religion is treated overall. I think, on the whole, the book is respectful of belief in God. Ruby Clyde has some unusual thoughts about Biblical teaching - e.g., she feels that Mary nagged Jesus into changing water into wine at the Wedding at Cana because "she just wanted wine" and that "Adam was a wuss" because "God made him weak" - but I never got the impression that these were anything more than a child's immature (and funny) reflections on pieces of scripture she doesn't yet fully understand. (In that sense, Ruby reminded me a lot of Lucky from The Higher Power of Lucky, who doesn't quite know what a higher power is, but still wants to find one.) Certainly kids who know their Bible stories will understand Ruby's references in these passages and understand that her interpretations are a little off the beaten path. I appreciated that these references were in the book at all, as Biblical allusions are not all that common in mainstream kids' books. I also appreciated the fact that Sister Eleanor makes it clear that she wears her habit by choice. I think it is a common misconception in our secular culture that Christianity oppresses women religious (and women in general) by forcing them to do things they do not want to do. In fact, though, women who answer a calling to become nuns, do so of their own free will, and though they may take vows that thereafter require them to do certain things or dress a certain way, they fulfill these vows each day by choice. It was nice to see this understood and explicitly stated in a casual way. The book does mention Catholicism in one scene, and obviously that caught my attention. When the Catfish first hears of Sister Eleanor, he becomes agitated and calls out to Babe and Ruby Clyde, "You Catholic?!" I will confess that this rubbed me the wrong way a little bit at first, since his tone makes it sound like being Catholic is about the worst thing that can happen to a person. But as I read Ruby's explanation of her grandmother's distrust for Catholics, and her quick summary of the development of the Anglican church because of Henry VIII, I realized that the only anti-Catholic sentiments in the book are associated with villains of the story, and that the characters who have the reader's sympathy remain either neutral or silent about the Catholic church. I understand the need for the author to mention it, both as a means of delivering historical information about the Episcopal church and as a means of explaining that Eleanor is not a Catholic nun, as many readers might otherwise rightfully assume. Part of me wished for just one more sentence to clarify that Catholicism isn't inherently bad just because some people feel it is, but I also tend to resent it when authors over-explain themselves so an extra sentence might just have been overkill. Ultimately, I don't think the book espouses an anti-Catholic worldview or that it would sway a young reader with no prior exposure to the Church to automatically condemn it. I do expect Catholic kids might not like the Catfish too much, but no one is meant to like him anyway, so they would not be alone in that feeling. Religion aside, I do have to admit that this book was not really my cup of tea. I was expecting a funny story a la the Mercy Watson series, but what I found was more quirky than zany and overall more emotional than I was anticipating. I think the story is well-written, and there are entire scenes that came across so vividly I can replay them in my mind even without the book in front of me. I liked Ruby Clyde and I found the resolution to her story believable and satisfying. I just don't think I was in the right mood for a sassy tomboy character, or for the strange and unfortunate circumstances that shape the events immediately following her birthday. I would definitely have no qualms about recommending the book to Christian families (even the Catholic ones! ), but I do think it's a book that a certain type of reader will appreciate more than others. I could appreciate what was good about it; I just didn't feel that it was my type of book overall. Either way, I think Corabel Shofner is an author to watch in the coming years. Almost Paradise is a strong debut, and I'll be curious to see what other stories she tells in future novels.